Welcome to Fully Human Psychotherapy. Fully Human is a private psychotherapy practice owned and run by Avigail Abarbanel. Avigail has worked in private practice in Canberra (Australia) since 1999. She moved to the Scottish Highlands in January 2010 and reestablished her practice in July 2010. Avigail is a BACP Accredited psychotherapist, and (UK Other Professional Body Accredited) Member of COSCA. She is on the BACP Register and on the COSCA Register. Avigail works with adult individuals, couples and families on a variety of life issues. She is a supervisor and she also runs groups and facilitates workshops for professionals and offers seminars and talks for the public. 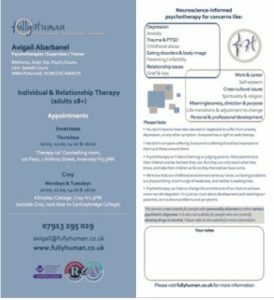 • Fully Human Psychotherapy practices a policy of non-discrimination. Fully Human is not affiliated with any faith or religion and is welcoming to the LGBT community and to people of all backgrounds, cultures and creeds. *Please note that the usual waiting period for a first appointment with Avigail is 3 to 5 weeks. If it is urgent for you to see someone, please do not wait . You can try Lorna Gunn on this site, the BACP Find A Therapist facility or the COSCA Directory to locate another therapist in the area. Other options are to ask a GP or someone you trust for a referral.